"Paralympic champions and Vicair wheelchair cushions... a good combination "
Mirjam de Koning-Peper is a former professional swimmer and a specialist in the 50, 100 and 400 meter freestyle and the 100 meter butterfly and the 100 meter backstroke. Mirjam was born with damaged connective tissue. Over the years her condition deteriorated and Mirjam had to spend most of her days in bed. For this reason she had experimental surgery done in 2000, during which unfortunately a nerve was damaged. This left her with a form of paraplegia and she had to start using a wheelchair. After the surgery Mirjam decided to play basketball, but after 4 years she had to stop as she had too many basketball related injuries. In 2004 she switched to swimming. What a success story this decision soon became! She participated in 2 Paralympic Games (Beijing and London) and won 3 gold medals, 2 silver medals and 1 bronze medal. 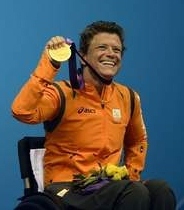 During the closing ceremony of the Beijing Paralympic games she proudly carried the national flag of The Netherlands. A few months before the London Paralympics Mirjam came to Vicair asking if we could help her during her preparation for the 2012 Paralympics. At that time she was suffering from pressure injuries and they were affecting her Paralympic training schedule. Of course we immediately agreed to help and the same day she was using the Vicair Vector. The pressure injuries healed, Mirjam could train more and … won Gold medal on her last Paralympic race ever. After this last Paralympic race Mirjam became a member of the product development team that developed the Vicair Active wheelchair cushion. Mirjam: “I’m very happy with this Vicair cushion. 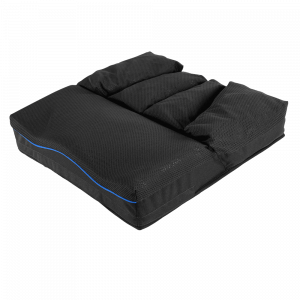 The foam front provides even more stability and I sit very comfortably on the compartments with air cells. I believe the front compartment improves wheelchair handling. Now I always use the Vicair Active during my dry land training program. ”. The Vicair Active is available in an improved version: De Vicair Active O2 | Machine washable and 100% breathable!